Who knows what forbidden fruits grow in the Secret Garden? Apart from the juicy fruit and exotic flowers, there are a whole species of enchanted butterflies fluttering their wings throughout this sumptuous exclusive slots game. Make your way through the adventurous secret garden and hunt out some special bonus features and prizes. Once you've played this you will be telling everyone that the Secret Garden is your favourite place in the world. Rival Gaming was established in 2006 and quickly become a popular online gaming developer with over 150 games created so far. Their uniquely themed online slot games are full of bonus features, stunning graphics and animations, and require players to use their skills to enjoy the immersive gameplay. Players especially love that they don’t use the same old boring symbols, each game is tailored to the theme and expertly designed to keep things fresh and interesting. There are lots more Rival Gaming games available on casino slot games. What grows in the Secret Garden is a romantic mystery. You have flowers, vegetables, and cute creatures in this beautiful online slot, and the sounds of nature accompany you on each spin. You have 5 reels and 20 pay lines in this online game, with adjustable coin values you can watch the love grow from 20p to £55 per spin. Coin values range from 1p – 25p, and you can place up to 10 coins on a betting line. Decorating the reels are all kinds of nature-inspired symbols, you have the Rabbit with his carrot, a Squirrel with his nut, a Boy Gardener, a Girl with a flower, a Wild Robin, a Flower Bonus Key, a Scattered Garden Gate and three colours of Roses. You also have gardening tools which make up the lower value symbols such as a Wheelbarrow full of flowers, Hand Tools, a Watering Can, and a Water Basin. The Wild Robin will substitute for any symbol in the game when it’s possible to form a winning line. It can also form its own winning combinations, if you land 5 Wild symbols on an active pay line you will win 5000 coins. 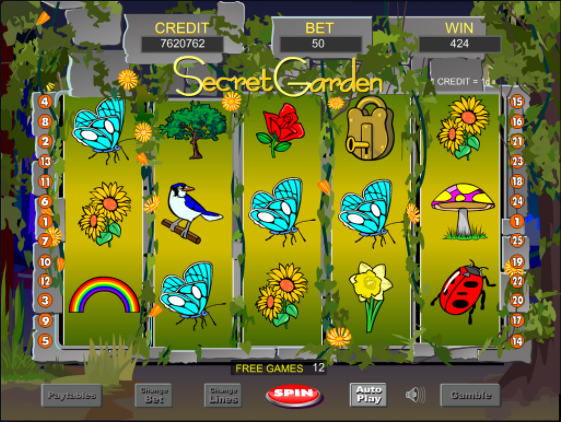 If you land 3 or more Garden Door Scatters you will trigger the Free Spins feature, you can win 20, 30 or 50 spins depending on how many Scatters you land and your winnings are doubled during the feature. If you land 3 or more Bonus Flower Key symbols you can activate the Secret Garden Bonus Round. Press the Bonus button at the bottom right of the reels and you will be taken to another secret garden. Here you will play with the Girl, with her watering can you choose random spots to water with the Water Drop cursor. The flowers will grow to give and ripen to give you Roses, a Key and/ or a refill your water symbol to keep playing. Find as many flowers as you can as they reward you with coins. 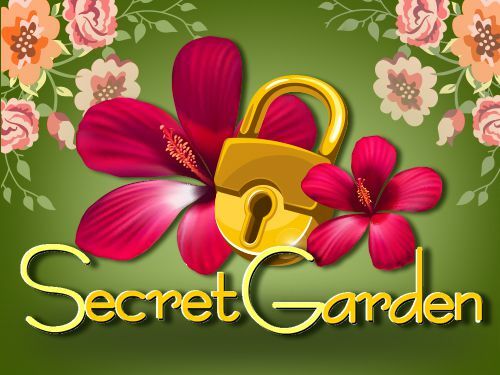 Gather Keys and water refills so you can make your way through all 3 secret gardens, and if you make it to the Heart Shaped Garden at the end you will receive even further cash prizes. This is a beautifully designed online slot game, full of nature and romance as you collect flowers and symbols for Bonus game plays. With its innovative gameplay features, you get to water flowers and collect them as they grow, explore more gardens with further chances to pick up even more cash prizes. The theme is relaxing yet still full of mystery and fun as you unearth your prizes. A slightly different game for you to have a play on is Rio Bingo.